The historic Green School was built in 1871 to replace an earlier structure which stood on the same site and which by that time had fallen into great disrepair. The 1870 School Committee report for Middleborough noted that "the schoolhouses in No. 3 [the Green] and 14 [Fall Brook] are poor and inconvenient, and in our opinion unsuitable for school purposes. If the town does not deem it advisable to build more than one house the coming year, we most earnestly recommend that steps be taken to build a house at the Green, suitable to accommodate that school ...."
As a consequence of the Committee's recommendation, the following year a schoolhouse was constructed at the Green. "Your committee have done nearly as much as the means in their hands would enable them, to improve the condition of the school buildings. A new house has been built at the Green, No. 3, according to the vote of the town, at an expense of $1,674.67. This includes a new fence. It stands on the ground so long occupied by what had become an apology for a schoolhouse, and which has been sold for $75. The new house is 24x36, is a neat structure, with blinds, and will accommodate 56 scholars. It has modern seats, a sink, extensive blackboard, and many other conveniences. The building deserves to be appreciated by the people of the district. It has been honestly and creditably built by Mr. James P. Sparrow." The cost of the school was broken down as follows: James P. Sparrow, per contract, $1,500; B. N. Bradt & Company, furniture, $172.47; and George Soule of Middleborough, chairs, $2.20. Built to accommodate over 50 pupils, by the late 1930s the school was housing just half that number. 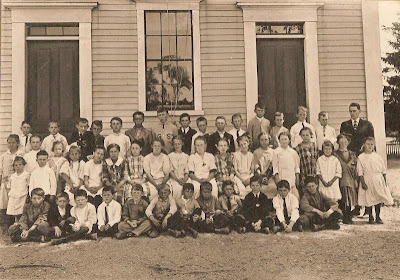 The small number of scholars coupled with the age of the building (it was nearly 70 years old) prompted its closure in 1941 at which time the students were transferred to Middleborough Center. Later, the school was reopened and served for a number of years as a kindergarten before finally closing in June, 1991. Efforts have been undertaken to save this historic and architecturally significant structure. Former Selectman Lincoln Andrews has started an initiative to raise funds for the preservation of the building. (Some of you may also have seen Lincoln featured on "Saving Our History" on the History Channel). As of Friday, May 22, over $11,000 has been pledged towards preserving the school. Lincoln encourages those who are able to do so to consider making a pledge to the cause. We are now at the point that small donations will make a significant impact. There is enough in pledge dollars to accomplish a project. Your small pledge will now add up to critically assist in the effort. People can take pride they assisted in any amount. I was called by a wonderful couple whom I did not know that made a 25 dollar donation. The reason was compelling and heartfelt. It was best pledge made to date IMO. Teacher, C. Harold Striley, stands with his pupils (two of whom wear G. S. sweaters) in front of the school. Notice that the school's facade today is much different from its original appearance as seen in the photograph.